4. Works deep in to your muscles, 300 x 1,5 cm nails. 6. 30-day money back guarantee � buy and try. Not happy? � We refund you! 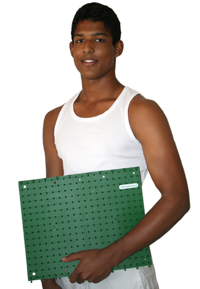 "I often use the Acupressure mat when I treat patients. The combination of 15 minutes on the �bed of nails� and then 30 minutes of local massage is ideal! The blood circulation to muscles is increased by first lying on the Acupressure mat, and so the muscles are already warmed up when I start my massage. This means that I can start my deep treatment much more quickly. I have many returning customers who appreciate the combination of first lying on the mat and then having massage! I often use the Acupressure mat myself - it is a good way of winding down and at the same time giving myself an �acupressure treatment� after a hard day at work! "